The relentless screeching of seagulls, and a silvery midnight sun, welcome me to the small city of Tromso, in far northern Norway. Tromso, known as the capital of the north, a gateway to the arctic and base from which many people, in the winter, begin their quest to spot the ever elusive northern lights, and to me, as the home of the electronic duo, Royksopp, is a lively city, home to around 50,000 people, surrounded by stunning wilderness and 217 miles north of the arctic circle. Having spent nearly 24 hours flying, and attempting to catch even the slightest moment of rest in various bustling airport lounges, first catching a flight from a misty San Francisco out to Rekyjavik, then a flight to Oslo, and then finally into Tromso, when I finally began my descent into Tromso, and perhaps somewhat due to my sleep-deprived state, it felt almost as if I had found myself entering into some dream-world. Below the plane, shimmering fjords like crinkled sheets of paper-thin metal reflected the iridescent sunlight, each fjord surrounded by jagged steep edged mountains, all in shades of green and brown and black, stretching into the sky, some even in the heart of summer still topped with a sprinkling of snow. Every now and then, opportunities will present themselves that are just a little too exciting to pass up. For such an opportunity, I find myself in Tromso. 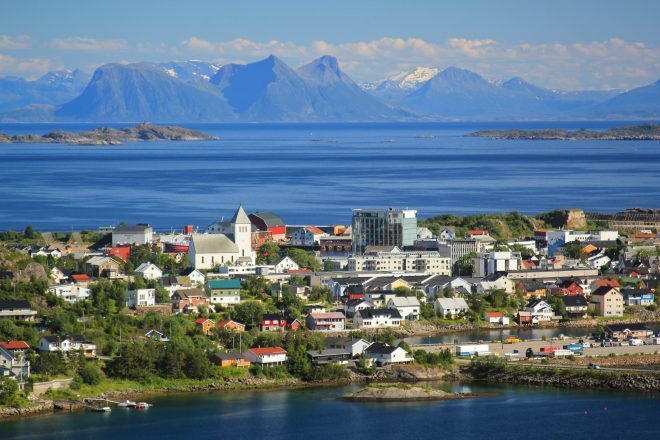 I’ll be riding a bicycle from Tromso, along with my friend Darren Alff, to the town of Svolvaer, cycling my way south along the arctic coast, carving my way across islands and spending the evenings in various traditional Norwegian accommodations. The trip is very generously being sponsored by Active Norway, and will cover almost 200 miles over the course of seven days. For now, however, from the 1st of July until the 3rd, I’ll be staying in Hotel Amelie, attempting to re-synchronise my body clock, which is really quite confused by the lack of darkness, and preparing my bicycle, and myself, for the coming adventure. Mike is currently in California, working on a new van, and soon we’ll have some news to share about that, too.